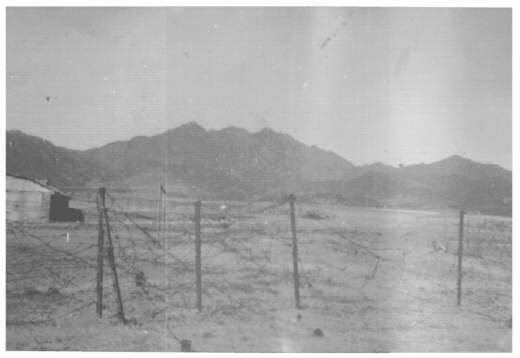 Razmak North West Frontier.Circa 1946-47. Razmak 7.156 feet British Fort 80 miles from Bannu into Tribal territory. Taken by Victor with Kodak six twenty Brownie. Shutter open. camera on arms shell box. A sudden flash and loud report Our American Long Tom 7″. 2 heavy gun with a discharge of a 200 lbs. shell of steel to the target of Pathan Tribal village. With its flash Lighting up the dark night Sky. Sniper Pathan Tribesmen returned fire to whence the flash of our firing heavy gun betrayed our position to them. Razmak 7.156 feet above sea level a British out post high up in hostile territory of the North West Frontier. Ralwapindy saw the last of so called civilisation by our standards but even here craftsmen made guns in the Bazaar with a file and their feet. It was then a further journey of some eighty miles from Bannu to Razmak. [The time at Bannu it was to my mind very hot you could fry an egg on the side of the reused air craft crates we were housed in at Bannu].The road having to be opened once a fortnight by the use of infantry going out like a telescopic two columns of heavily armed seasoned troops protecting each side of the road.We journeyed in our transport trucks gasping at the sight of the winding road, the incline and drop to the valleys below.We were soon to learn about Fakir of Ipy and holy wars – The old Fakir moved his gun around the mountains. And we played at snow balling in winter when outside of Razmak clearing a part of the road with our snow plow contraption. Not a day went by without some skirmish be it by patrols of the Gurkers or our gun sometimes shelling on the dusk evening tide. I had taken many photo shots with my cherished six twenty box brownie which I had bought in Bombay for six chips. (one rupee a chip about 18 old pence).It was not all doom and gloom Christmas day was fun I seem always to have a bottle in view.The meals were a constant repetition of American dried eggs and after six months we all felt the char walla saved our gut with his Char and a wad. Football matches were played often. Len Hancock, who had played for Wolverhampton, being one of the good players.If you were a good snooker player you could be in for long stint on the one of the tables in the canteen. We listened to the radio one time or someone tuned in to which was radio S.E.A.C. (broadcasting far away in Ceylon. South East Asian Command) Some friend of Josh Spinks(radio commentator) was in our Battery and request was put in for our leader. (Battery Commander): ” The pessimistic character With the crab apple face”The humour of which regrettably sometimes went to the wire! Salutations was expressed to all our Battery personnel. In those famous words, let us all hope to be home soon. The foot and palm prints of Betty Grable ? and I believe Dorothy Lamour ? were permanently set in recessed image on a slab concrete. We very Young lads who often drooled over anything associated with female scent. There being no women in Razmak apart from tribal kind on the outside of the wire. This is above is updated by Auster Pilot George Cox now living in Alberta. “It is so authentic it is a joy to read and brings back so many memories.’ From July to Sept 1947 I was the Auster pilot in Razmak. I had been sent on a REST! from being General Rees’s pilot in the Punjab,trying to stop some of the ugly mayhem there. Incidentally it wasn’t Betty Grable and Marilyn Monroe,Razmak was far too rough for Americans,it was 2 English showgirls visiting with an ENSA company. Anyhow it gave us a bit of sexual excitement in an otherwise all male environment. Probably the pilot in your time was Donald Murray, poor devil he had been a POW most of the war and ended up behind wire again in Razmak, Talking of Spike Milligan and Harry Secombe,two famous members of 56 Heavy Regt,It was in Beja,Tunisia,in summer 1943 that they first were involved in a very successful 2AGRA pantomime. I was also in 2AGRA but not involved in the pantomime. Spike was of course the instigator of all the riotous happenings,and I have always thought that this was the beginning of such a successful career. If you haven’t read his book “Hitler’s downfall and my part in it” you must. Unfortunately I am now living in Alberta or it would be great to get together,There can’t be many people left who did a stint in Razmak. Auster Overhead Maybe it was pilot George Cox. If you fell into tribal hands one would be minus breeding male copulatory organ parts. The bottom toilet block was never used after night fall. The old soldier’s bloodthirsty tales of balls being cut off from the back of the latrine block. Where the cleaning ‘walla’ of the toilets placed behind the toilet an oblong cut out of gallon oil tin container. Into which one discharged one’s body waste. Fear did not exist only the desire to serve out our time and carefully watch ones scrotum breeding male organ parts, when resting ones backside in the toilet block. Tribal fighters often came into our Razmak fort leaving their guns at the gate post. On going back out into their own domain they would Often fire a few rounds at us if the chance presented itself. A sniper round once just missed me and hit the wall nearby. I kept the dented round for many years. With time I wondered if it was aimed at me or just a dream. I also kept a souvenir of a treasured badge of the 1st Gurker rifles. We had a haunted billet and only two of us stayed the course in it. A Sergeant, who shall be nameless, woke up screaming next bed to mine after a brave go at trying to ridicule the whole thing. There was a bazaar and a little cinema and I did attempt a little part in one of the shows but chickened out. I was too be an Indian squaw and had to whine out “oh! big face Indian Chief?. Please come into my wigwam’.This was wailed out three or four times, getting higher and higher each time.The last high whine sounded like when you’ve had your balls caught in a mangle.Stage set up for the sketch, centre stage is a wigwam and cloak. Then a big thunderous voice of the Sergeant major type boomed out “Don’t be a bloody fool go into her bloody wigwam.” The show or Christmas pantomime was arranged by one talented officer who also used the music of the Eton Boating Song a different lyric. The catchy words we sang out and pranced about the small stage. I can remember to this day the words: “da de dah– we’re clerks as you can see, — busily engaged on work to help the nation”. While our superiors we never get a cup of tea”. But I was redeployed for being unable to control my laughter. Gnr Milligan, not Ole Spike, took the part to a tee and remarked listen to Taffy singing. We were not infantry but ‘gentlemen’ of the heavy regiment of Artillery. Spike Milligan, Harry Secombe and the older generations who also served in the Heavy regiments would understand about the laugh that we had from this adventure. It is now like a dream for at that time I was only a young squaddie, so much protected by the older, seasoned lads. The only casualties we had were two of our mates being circumcised. And a piece of glass I had taken out from my forehead, from way back when I had blown myself up from making bombs of with carbide. All in all we were probably the last of the British in this fort. 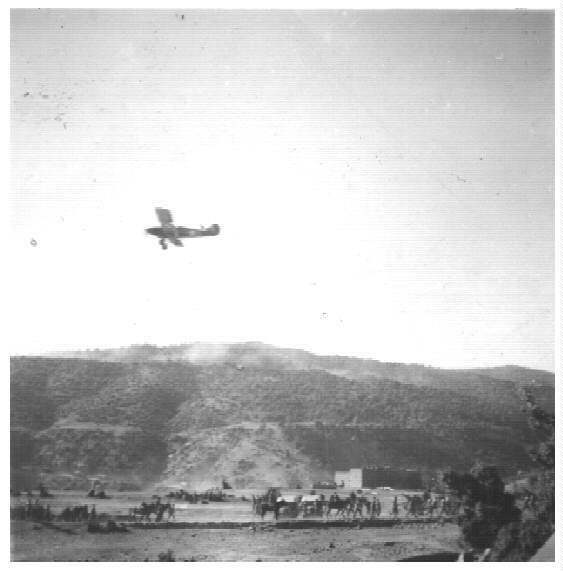 I saw Pandit Neru land at Razmak and I have a photo of the event the Indian Artillery had to shell the hills to curtail the sniper fire. Finally we left for the plains and went through the Kohat Pass on our journey. Those pre-war times were a contraction of various Regiments with eventual them disbanded for ever Many old comrades and I were posted to other Artillery Regiments. I now ended back with 25 pounders Field Artillery The 123 field Regt. Training to perfection on the twenty five pound Gun. On which on taking my gun layers test I passed. With very helpful coaching by Sergeant Crocket and my Northern Friend George Limer. If my memory serves me right we were based at and around Rawapindy or Bannu again. Brothel creeping the area at leisure for amusement. Then the day of impending the anticipated move came the sound shots echoing with the shooting of all camp dogs and packing before our move south. We dug in our twenty five pound into a sandy soil at some part of Sind Desert more in an exercise in cementing or preparing our new crew together, we were in turmoiled times of those days. Were always ready for action in case of mass uprising. Bound on our journey south was an interesting experience and one stop over was at a place named Jellum. Washed fed and refreshed after our days travel then comes the lovely cool of sunset light. Come the prowl or hunt to a village what seemed to be a wild west type a innocent rectangular compound of veranda buildings. Sitting outside on each was an array of beautiful women dressed in colourful sari’s. Among our path finder group usually there is always one lad who picks up opportunities quick. Its an ore shanty we’ll have um all! But we did not get past the first couple of shanties of beautiful women. Soon exhaustion came the daylight went and the night closed in Deployment in our last action led to the Punjab and the Riots and Gujanwalla patrols with death and destruction Religious hate or cultural difference’s led to Fire bombing and knifing old men. Left dying on a charpoi (bed). My troop which was Dog troop often being in the thick of it. Being another sad chapter forgotten. We finally handed over to our comrades of the Indian Army who took over our camp. Along with its always hot water showers its water heated by constant sun and only were turned on at sundown supposed to be cold to cool our prickly heat raged bodies after our patrol. You can compare our withdraw from this land like so many before a part of history similar to the Roman great past. Once again I snapped the six twenty brownie camera has I had done on our way through the Kohat pass. I have an album of those photographs still with me. The years of the British involvement went on for two hundred years plus and if one would want further information I suggest reading operations in Warrizstan. Three Sisters. Outside the wire. goal post. Hanger and strip.